Special counsel to Nnamdi Kanu, leader of the Indigenous People of Biafra, IPOB, Barrister Aloy Ejimakor Saturday has cleared the air bothering the purported news that Kanu's sureties had applied to withdraw their suretyship. In a statement made available to Biafra Writers on Saturday, the legal luminary refuted the alleged back down of his client's sureties in their roles of signing the bail bond of their principal, Nnamdi Kanu. According to Ejimakor, “On the matter of revocation of Kanu’s bail and the consequent Order of bench warrant, I, Barrister Aloy Ejimakor, Counsel to one of the sureties and a Special Counsel to Nnamdi Kanu, hereby issue the following statement: The reports in the media quoting Justice Binta Murtala-Nyako as stating (when revoking Nnamdi Kanu’s bail on March 28, 2019) that the ‘three sureties who bailed Kanu had applied to the court to withdraw their suretyship’ is inaccurate. I should know because I represent one of the sureties and we never made such an application, or anything close to it. “On the contrary, the sureties have been fighting to stay on as sureties while pointing to the army invasion of Kanu’s home as the sole and proximate reason for their inability to produce Kanu in Court. That argument is still pending a hearing in a suretyship proceedings that was adjourned sine die at the time of the entry of the Order of bail revocation and the ensuing bench warrant. 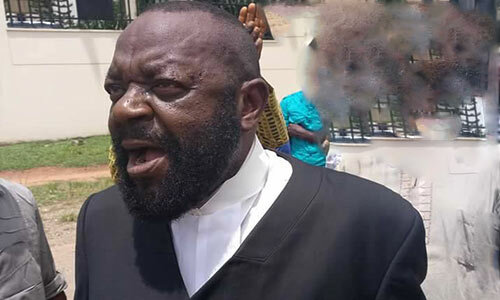 Barrister Aloy Ejimakor also took to his Twitter account, to share the same statement in the act of debunking the ‘flying news’ against his clients. Reports in the media quoting Justice Nyako as stating (when REVOKING @MaziNnamdiKanu’s bail on 28/03/19) that the ‘three sureties who bailed Kanu had applied to the court to withdraw their suretyship’ is FALSE. I represent one of the sureties and we never made such application.